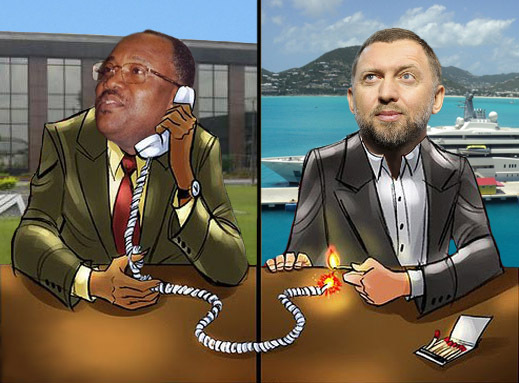 Last week, on October 7, United Company Rusal – the state aluminium monoply managed by Oleg Deripaska (right) — was due in the Nigerian High Court at Abuja to start trial on the claim by a Nigerian-American group, BFIG, for the handover of the Aluminium Smelter Company of Nigeria (Alscon). BFIG has been in the Nigerian courts since a ruling by a US federal judge eight years ago that the jurisdiction for its claims is in Nigeria, not in the US. In July of last year Nigeria’s highest court ruled that the government’s Bureau of Public Enterprises (BPE) had unlawfully privatized the smelter in Rusal’s favour, rigging the share sale and the price corruptly for Rusal’s benefit. The American government had already agreed. A US Embassy cable from Abuja, dated August 2004 and published by Wikileaks in 2011, told the State Department the Nigerian government’s action towards Rusal had reflected “a lack of transparency in the bidding process, and perhaps some corruption as well.” BFIG’s lawsuit claims $2.8 billion from Rusal in lost or unrealized profits, damages, and costs. Rusal has challenged the Nigerian Supreme Court’s judgement against the government, and is in the London Court of International Arbitration (LCIA), seeking to block the Nigerian court rulings and prevent BPE handing the smelter over to BFIG. A parallel proceeding by BFIG, this one against Rusal for damages, started in January 2012 in the Nigerian High Court. Rusal tried to have this dismissed, but the court rejected that on June 19, 2013. Trial was scheduled to start on October 7. Three days before, however, Rusal filed in court the claim that it should not face BFIG alone. It requested that the court put the Nigerian Government and its BPE on trial for the liability as well. This application has been set for a hearing on October 30. According to the Nigerian lawyer for BFIG, Olugbenga Adeyemi, and BFIG’s US lawyer, Jimmie Williams, these were delaying tactics intended to protract the preliminaries and prevent the trial starting. Papers filed on October 14 in US court in Los Angeles by lawyers for both sides reveal what is happening after the US judge, Carla Woehrle, requested reports of where the litigation in London and Abuja stood. Read these court documents (1, 2 and 3). The background to the Los Angeles court case can be followed here. Rusal’s releases, financial and production reports, and shareholder disclosures all report that the Nigerian asset, in which Rusal owns 85% (the remaining 15% is owned by the Nigerian Government) is a lossmaker for the company. Its cost of acquisition and current book value are so small that its practical value to the company appears to be minimal. Moreover, in 2009 Rusal admitted publicly it was trying to sell at least half of its shareholding in the plant. Supposing that a Nigerian buyer for 42.5% of Alscon could have been found at the time, and the buyer allied himself with the Nigerian government’s 15% stake, such a deal would have given majority shareholding to someone else, and ended Rusal’s control. So why didn’t Rusal exit then? Why has Rusal been waging court action in Nigeria, UK and the US to hang on? The Rusal arithmetic demonstrates just how little Alscon has seemed to be worth — to the Russians, if not to the Nigerians.. In 2006, when Rusal first proposed to pay for 77.5% of the shares, the deal terms valued the asset at $323 million. Rusal then got the BPE to cut the price – wrongfully and corruptly, BFIG argues — so the asset value dropped to $168 million. In December 2007 Rusal says it bought a 7.5% stake from a German shareholder for $12 million. That indicated total asset value of $160 million. “The impact of acquisition on the financial results of the Group for the year ended 31 December 2007 was not significant,” Rusal’s IPO prospectus claimed. Subsequent Rusal documents reveal it paid $140 million up front, and invested $76 million in works to restart the plant’s production line. As of December 2009 the book value of Alscon was $183 million, just 1.1% of Rusal’s aggregate asset value of $16.8 billion. It has continued to be a lossmaker. In the first quarter of 2013 production at the smelter was halted altogether. According to an audit by KPMG, by the end of 2011 Alscon appears to have owed Rusal companies $135 million. Because liabilities of the plant were recorded as greater than its asset value by about $46 million, Alscon was for all practical purposes bankrupt. For the accounting, read this. So why keep the asset so tenaciously, and at such a cost in lawyers in the UK, Nigeria, and California? One possible reason is that Alscon is worth much more than Rusal has let on, and that it is misleading its shareholders. A second reason may be that Rusal is afraid the Nigerian court proceeding will expose evidence of asset and cash stripping from the plant through tolling schemes and double accounting, and that BFIG may be awarded up to its full claim of $2.8 billion. A third reason could be that if Rusal submits to the Nigerian court and pays even the fraction of what Alscon is said to be worth, it may open the floodgates to court claims elsewhere. In nearby Guinea, for example, Rusal faces court and government claims for about $1 billion, there too Rusal’s asset position and bauxite reserves are much more valuable. The Guinea courts have ruled against Rusal, but Deripaska hangs on by fiat of the current Guinean President, Alpha Conde. If he goes, Rusal is unlikely to survive. The potential legal liability and writeoff potential in Nigeria and Guinea combined represent almost as much as Rusal itself is worth in the Hong Kong market at the moment — $4.5 billion. In fact, at that market capitalization Rusal is worth less than the 28% shareholding it owns in Norilsk Nickel, or about $7 billion. In short, Rusal’s assets are in negative worth territory. This is a particular problem for the international consortium of banks whose loans to Rusal are secured by smelter and other assets, principally in Russia. Moscow press leaks from Rusal’s current negotiations with its bankers indicate that the current negotiations cover obligations of $5.15 billion. Rusal’s capacity and promises to meet its debts are being challenged by Norilsk Nickel’s refusal to pay Rusal dividends which must be borrowed rather than earned. Rusal’s notice on the terms of its dividend arrangement with Norilsk Nickel was issued on October 1. This reveals that the annual dividend payable by Norilsk Nickel has been cut from the $3 billion per annum agreed last December to $2 billion in 2013 and 2014; a 20% cut from $3 billion in 2015; and the forced selloff of Norilsk Nickel assets in southern Africa and Australia. In short, Rusal is pressing to strip Norilsk Nickel of assets for cash to feed Rusal’s creditors. Things looks even worse for the future of Rusal as a stand-alone company if the next five years of Rusal’s trading prospects for aluminium are estimated. So the banks realize their ability to recover their debts is even more precarious. Part of the danger comes from the downward pressure on the price of aluminium as rule changes for stocking aluminium begin to bite on the premium Rusal has been able to earn from warehousing the metal instead of selling it. Rusal’s reaction has been to beg the market regulators in London and Hong Kong not to act. According to the Rusal version, the rule changes would be “distortions” in a way scheming by Rusal and its control trader Glencore is not. Rusal may succeed in putting off the day of reckoning for its unsold and hidden stocks. There’s less its begging can do about the determination of China to accelerate domestic production of aluminium. The decision in Beijing reflects the fact that China has much larger reserves of bauxite and coal-fired energy than have ever been counted to fuel the new Chinese smelters. According to still confidential reports circulating in Chinese mining circles, China will accelerate its drive to expand domestic metal production at a price which will force the international sale price of aluminium downwards. This statement ignored the strategic decision Oleg Deripaska had made in 2004 to end Rusal’s strategy of expanding its downstream aluminium processing businesses, and concentrate instead on upstream primary metal processing. Deripaska did that, calculating he would generate more profit for himself (and Roman Abramovich, then his shareholding partner) from an export-driven scheme than from doing most of the aluminium business at home, as had been the situation during the Soviet period. This isn’t what is happening in China, according to Chinese and international experts. But Rusal isn’t revealing what it knows. The last report Rusal issued for the geographic destination of its exports was in December 2009, on page I-41 of the IPO prospectus. This revealed that by June 30, 2009, China had outstripped South Korea and Japan as an importer of Rusal’s aluminium. By then only the Netherlands (that is, Rotterdam warehousing for sale and shipment elsewhere) and the US were bigger export markets. Four years later, Rusal carefully conceals where its exports are going. By identifying “Europe” as accounting for between 50% and 60% of export revenues, the company reports camouflage the final destination of the metal after it leaves the Glencore-controlled warehouses. The figure for China’s imports is hidden in the category called “Asia”. It is obvious, nonetheless, that this destination for Rusal’s exports is dwindling. It amounted to 23% in 2009. It dropped to 18% in 2012. It is already down to 14% this year. Chinese growth in demand for, and consumption of aluminium is indisputable. So is the increase in China’s capacity to produce more metal at home, and make do with fewer imports. Rusal’s annual report for 2012 continued the line that once the slowdown in China’s macro-economic growth reversed itself, the Chinese boost for international aluminium prices would resume. This isn’t happening.